I often do one accent nail with plain fingers because I think it adds a cute pop and is a lot less tedious than nail art on every nail. I chose to use Chanel's White Satin as opposed to a true white to give it a softer look. 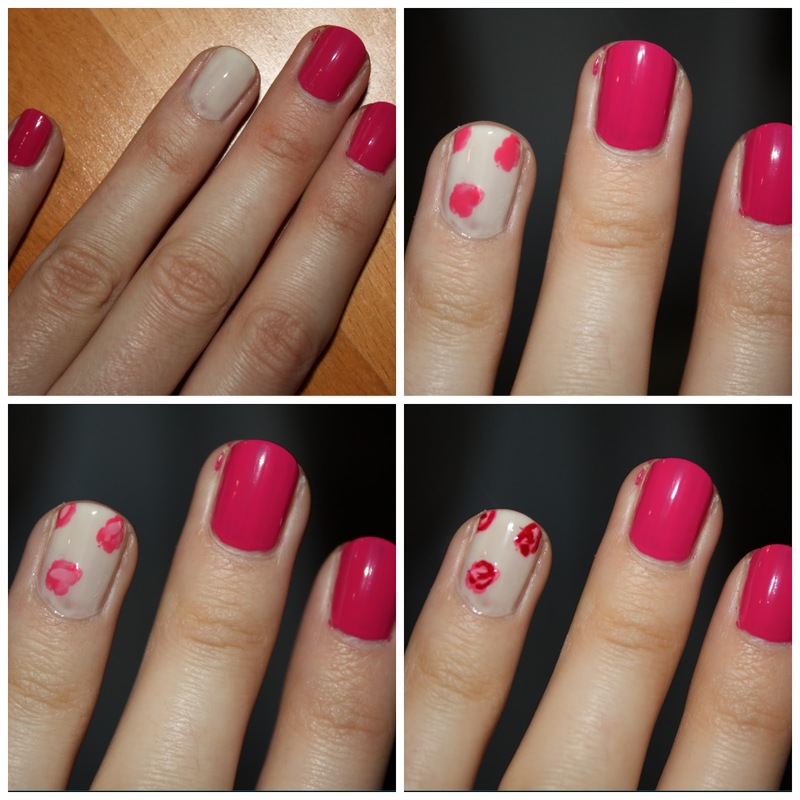 Step One: Apply three coats of White Satin on accent nail and two coats of Pink Flamenco on the remaining nails. Step Two: Using a small pointed brush apply three cloud-shaped circles of Feelin' Hot-Hot-Hot! on accent nail. Step Three: Using a small angled brush press two or three lines of Do Good... Feel Good on top of the circles. 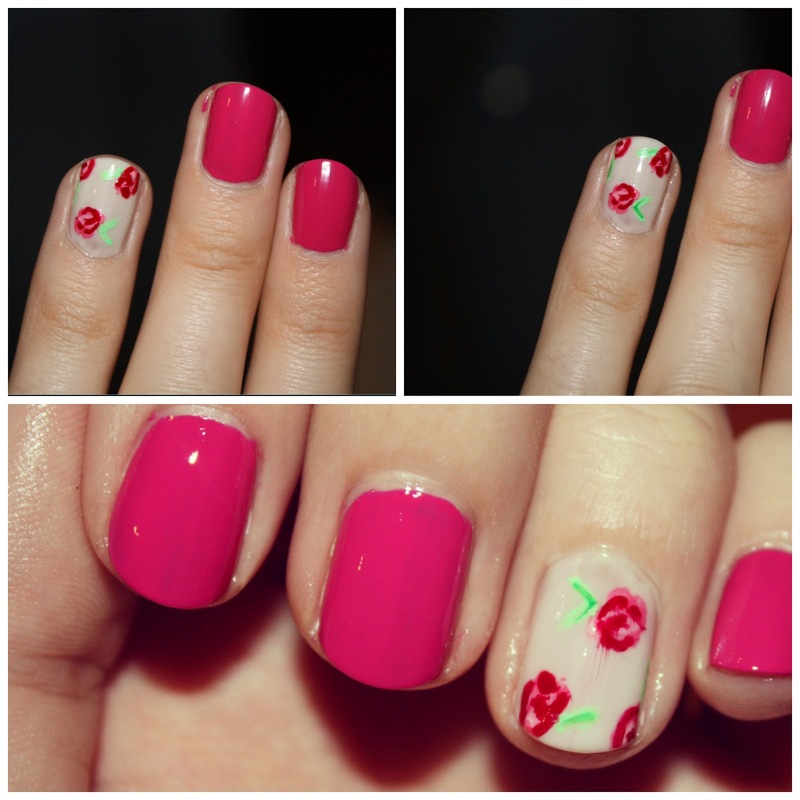 Step Four: Using a small pointed brush outline a rose shape over the circles using Quarter Of A Cent-Cherry. Step Five: Using a small pointed brush draw leaves using Twiggie. Step Six: Using NA06 Green paint an additional stripe on each leaf. Step Seven: Clean the edges of the nail, apply top coat et voila! Note: make sure you let the design dry fully before applying top coat, otherwise you'll get a bit of running like I did.